Wrote and led passage of HB 1045 – Neighborhood Safe Streets Bill (2013). This legislation removes barriers for cities and towns across Washington to create safer streets by lowering neighborhood speeds to 20 miles per hour. Protected $11.7 million in Safe Routes to School funding in the 2013-15 state transportation budget; reached all-time funding high of $30.45 million for Safe Routes to School and Bicycle/Pedestrian Safety grant programs in 2013-15 biennial budget. Amended SB 5263 to require motorcycles overtaking people walking and biking must pass with a minimum 3 feet of separation. Lobbied for $10 million in state trail investments to projects in Spokane, Anacortes, Redmond, Tacoma, and other cities across Washington. 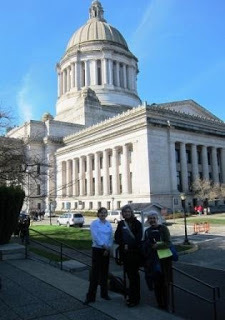 Lead bike advocacy organization for the state of Washington in working with national organizational partners on implementation of MAP-21, the federal transportation bill adopted in 2012. In 2011 passed HB 1129, which expands on teaching motorists how to drive safely around bicyclists and pedestrians in Traffic School curriculum. Helped pass ESHB 1071 in 2011, a bill that establishes a Complete Streets grant program. Amended SB 5482 in 2009 to require jurisdictions to detect bicycles at traffic signals (now RCW 47.36.025). Leading lobbyist in the passage of SB 6345 – the Text.Talk.Ticket Bill. This legislation makes texting and handheld cell phone use while driving a primary offense in Washington state. Passed first legislation that requires public school driver’s education programs to incorporate the safe driving around bicyclists and pedestrians module into their curriculum (HB 2564). In 2005, passed HB 1108, prohibiting passing when cyclists, pedestrians, farm equipment is in view and approaching from opposite direction (Ann Weatherill Safe Passing Act). Also, in 2005 passage of SB 5186, requiring comprehensive plans to include an inventory of bicycle and pedestrian facilities. Worked with then-Rep. Ed Murray to provide $1 million in funding for the first Washington state Safe Routes to School pilot program in 2004. Successful work in subsequent years to protect and expand state investments to now over $50 million in state and federal Safe Routes to School projects and programs. Passage in 1998 of Cooper Jones Safety Act. The bill created a bicycle and pedestrian safety education program under the Washington Traffic Safety Commission. In early 1990s, worked to fund first bike/ped state coordinator and first state planning for bicycling. Worked with five South King County school districts to implement comprehensive Safe Routes to School programs. Trained teachers in 42 school districts across Washington State how to instruct over 55,000 students on safe biking and walking skills. 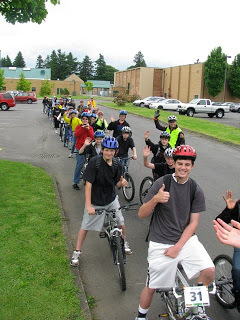 Provided Safe Routes to School community trainings in Spokane and Ephrata. Go by Bike, a pilot program designed to bring bicycle safety education to college students, was launched in 2011 with outreach to partnering community colleges in the Puget Sound region. Over 2/3 of students in the program at four schools have been women–the inverse of the national averages in gender split for bicycling. Printed and distributed Share the Road tips flyers for motorists, bicyclists and pedestrians and a pocket guide to Washington state bike laws. Meetings with advocates held in communities around the state every year to meet with bicyclists, discuss statewide priorities for better bicycling, and listen to what’s on the minds of cyclists around the state. Partnered with Snohomish County, the Centennial Trail Coalition, and others to rally support for the completion of the 27-mile Whitehorse Trail connecting Arlington to Darrington through the stunning Stillaguamish Valley. This project gained momentum in response to the SR 530 mudslide near Oso. Tripled the number of League of American Bicyclists Certified Instructors in the Inland Northwest by hosting a training. Helped Holmes Elementary in Spokane’s West Central neighborhood implement a Walking School Bus program. Over 6000 Share the Road license plates sold. Thousands of followers on Facebook and Twitter who share and engage with our posts on bike events, projects, trails, groups, policy issues, and more from around the state. See Timeline for additional accomplishments.